So what is it and why is it here? Well, in 2002, through my day-time capacity as a designer and publication coordinator, I found myself agreeing to design and layout a book by Vincent Cincotta with the title Zarzuela. The Spanish Lyric Theatre. It was an encyclopedic manuscript full of colour pictures and everything you've ever wanted to know about a form of traditional Spanish musical theatre designated as 'zarzuela' -- popular, spectacular and with a long and prestigious pedigree. The author worked at the University of Wollongong and the project was the cumulation of decades of effort. I couldn't resist. A year later the book was completed and published (by the University of Wollongong Press), all 776 pages of it, complete with a history, biographies of composers and librettists, plot synopses, discography, bibliography, chronological tables and a full index of titles. More information on the book, including reviews, can be obtained here. Of more relevance for me (and why it is mentioned here on my site) is the fact that the book was winner in Category 12 (short-run digitally printed book) of the 27th Annual Galley Club Awards for Excellence. Quite an achievement for Vincent and for myself! The printer, dBooks, is, of course, to be congratulated on their efforts, as the job they did in printing it was immaculate and the finished product looks magnificent. 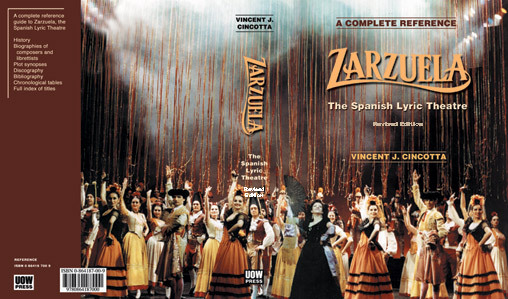 Also available is Vincent's review of another book on Zarzuela that came out subsequent to his. In a spirit of fair play, he has given it a balanced and objective evaluation.